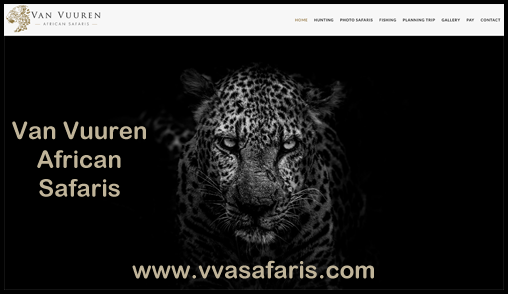 Bootprints.TV is an Internet TV show, with video adventures on hunting and fishing in the great outdoors! Join me, Troy McCormick, as I explore the woods and waters throughout the United States and around the world. Watch another exciting season of episodes this Fall, October through December, on the Hunt Channel (http://www.huntchannel.tv). If you missed any shows from Season 1 they are available in the Hunt Channels Video on Demand library. There is no longer a worry that you won’t be able to watch our hunting and fishing adventures on your local cable provider because this is an Internet TV show that can be watched on your computer, tablet, smart phone, and Internet connected TV. 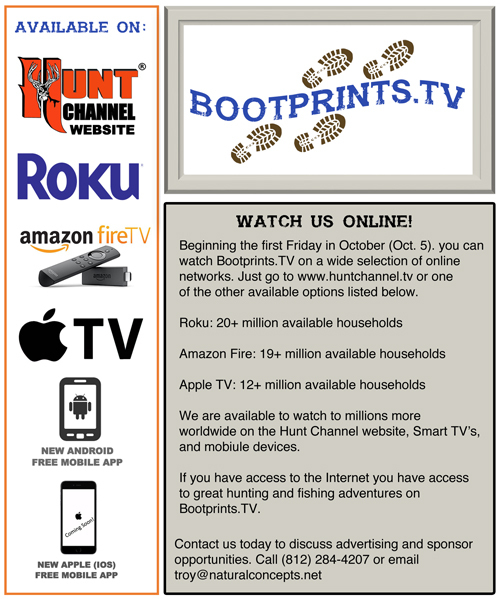 In fact, you can watch the Hunt Channel on ROKU, AppleTV, AmazonFire, IOS Ap, Android AP, and AppleTV. Bootprints.TV is available in 55+ million households each Friday evening at 7:00 pm (October through December). And if you’re busy Friday night, each episode will repeat five times the following week, and be available in the VOD (Video On Demand) section of the web site. As I have walked and hiked throughout the years, I have always noticed that my bootprints mark my temporary passage through the woods, along a creek, or across a mountain pass. I may be hunting elk in Montana, fishing for smallmouth in Canada, or on safari in Africa, and I always leave my bootprints on the trail. After eight seasons of filming, hosting, and producing the nationally televised, Indiana Outdoor Adventures TV show, I am back on the road traveling and finding outdoor adventures beyond the geographic boundaries of Indiana. In the last year I have had the opportunity to travel to Scotland, South Carolina, North Dakota, Montana, Kentucky, Texas and South Africa. Bootprints.TV is an opportunity for me to continue sharing my outdoor adventures as I travel throughout the woods and fields. So, come on and join me as I leave my next set of bootprints in the great outdoors!